Now that I've moved to up north to Massachusetts, I've found that the gardening season is compressed. There seems to be a lot to do in a short amount of time before winter comes! I have been busy the last few weeks making beds, buying and planting all those end-of-the-season discount plants, mowing down all the brush in our detention pond, and starting the planting of the bulbs. But, believe it or not, this blog post is not about my new garden. We've also been working on some interior projects, and I have my first guest blogger to talk about one of them. This blog is brought to you by a very special guest blogger - Mr. Red House himself! When finishing our house we found that we had a pretty blue living room with a very very blank wall on it. See the huge blank spot on the left! We had seen a very pretty but oh so expensive wood art that we liked at Pottery Barn. This can be yours for only $399 at Pottery Barn! Lucky for us we felt very crafty! We had some leftover flooring from the construction of the house and decided to put it to some good use. There was more, but I forgot to get a better picture of the huge stacks of flooring! Step one was layout out a pattern on the floor, making sure we had enough wood. Once we had it all laid out we decided to paint each of the pieces pretty colors. Initially a good stain seemed the ideal choice, however we discovered that the cool colored stains were outdoor only and they would not be safe to have indoors. Instead on towards paint we charged! We lucked out and Lowes was having a sale on sample cans of paint! Six different colors were selected. Foam brushes are an awesome invention! Now we've got paint, brushes and a pattern laid out, the next step is to carefully separate the pieces so each one could be individually painted and reassembled correctly. 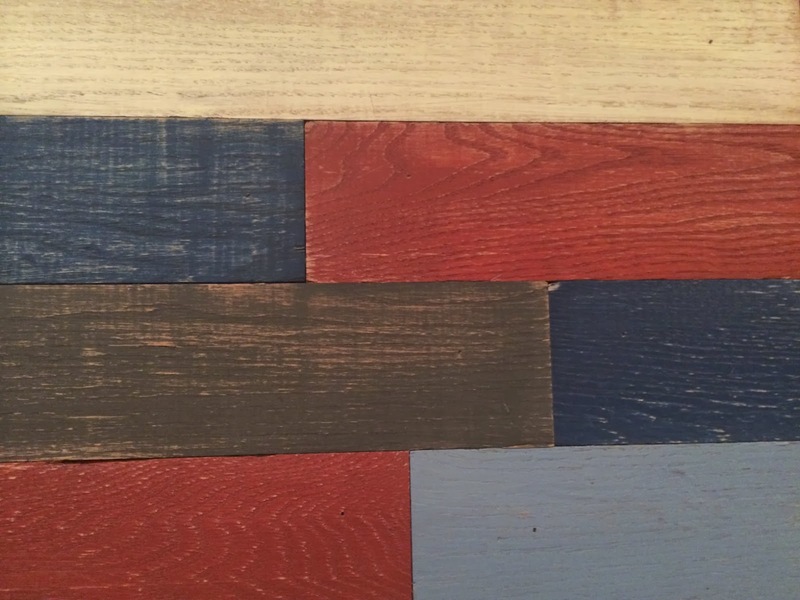 We are going for a rustic theme to the house, so I explained to the kids to go easy on the paint so that the wood grain would show through. 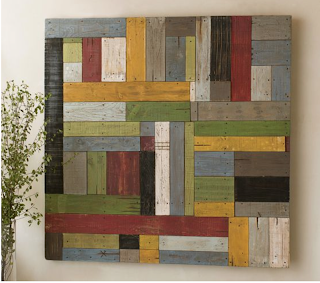 Somehow in that explanation any large blob of paint spilled or other mistake became "rustic!" 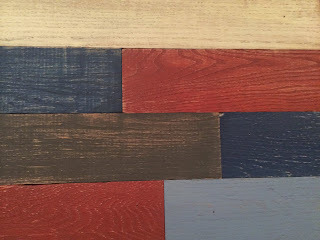 Finally finished painting and let our disassembled wooden jigsaw puzzle dry. Then we ran into our first challenge. We are dealing with hardwood flooring that has awesome tongues and grooves, however without a backing it won't stay together that well. After some discussion and an emergency trip to Lowes to get a large sheet of plywood and lots of wood glue, the project continued! Here we are gently laying the pieces on the plywood. 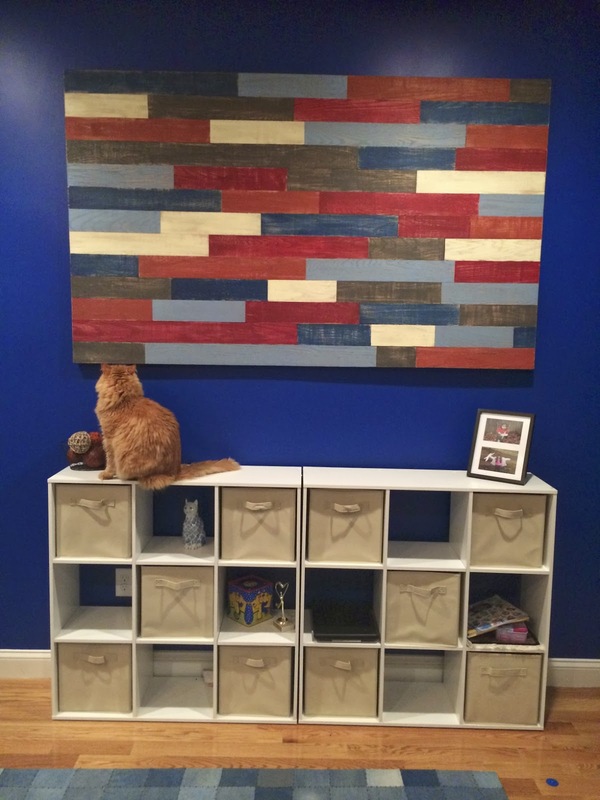 Each piece was held down with wood glue and my handy dandy nail gun! The weight of the pieces was sufficient to adhere to the glue. I put in two nails per piece of flooring just as an insurance policy. Here is is all glued and nailed down. Final size was about 6 feet wide by 4 week tall AND about 200 lbs! I adore how the wood grain turned out! We then did some heavy hand sanding for that weathered and rustic feel. I originally tried a power sander, but found a simple hand sander with 100 grit sandpaper let us gently weather the wood strips to give a nice aged look. Now for the second challenge. The entire piece weighed about 200 lbs! I suddenly realized I hadn't planned how to put this up on the wall so that it does not come crashing down. After extensive research, French cleats were the answer. French cleats are two pieces of metal that form a rail and can hold significant weight. Here's a Home Depot one that holds a good amount. While the weight was fine, I sadly could not use it because our wall studs are 24" apart and these hangers are only 18" wide. I didn't feel safe unless I had at least two studs. That's a 5 foot pieces of aluminum up there spanning 3 studs. I ended up mounting it to three studs and using 4 additional wall anchors. I went for overkill, but boy is that thing heavy! Here it is in all of its mounted glory! 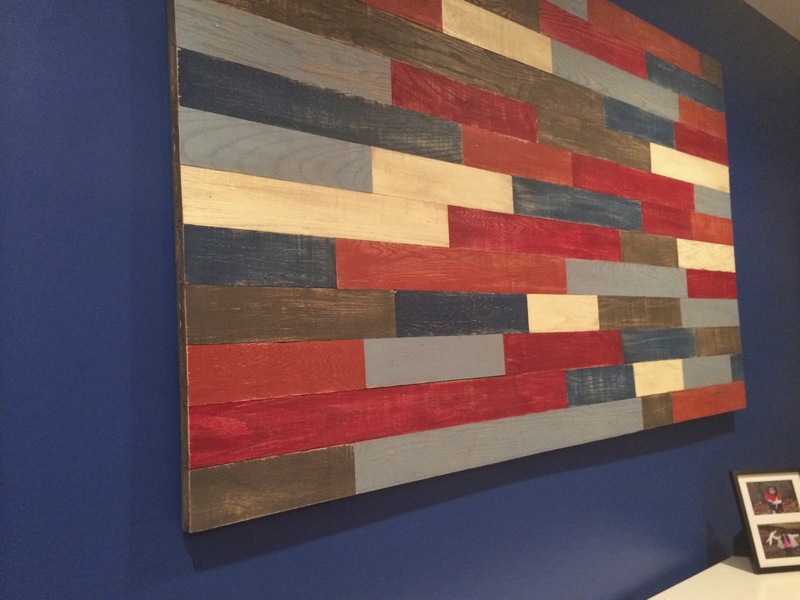 Our large blue wall now has some rustic charm! Now I've spent an entire blog talking about something non-plant related, unless you count the wood which is very plant related! So I leave you with the obligatory pretty flower picture. I have no idea what this is, but it's pretty. Did You Win Any Brownie Points? 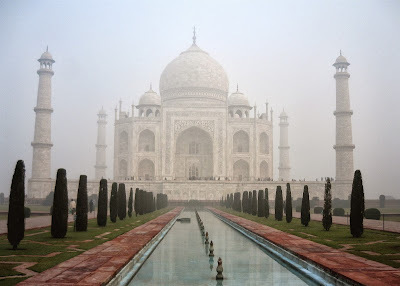 The Taj Mahal, built by Emperor Shah Jahan in the 1600's as a tomb and testament of love to his wife, Mumtaz Mahal, who died giving birth to her 14th child. I have been in the beautiful country of India! Brownie points* to those who guessed it correctly! This was my second trip to India. 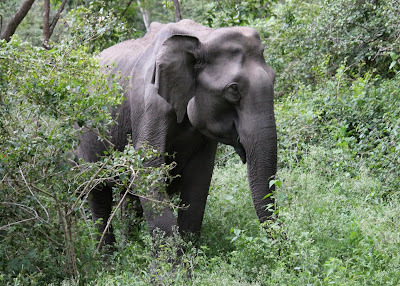 I first visited India in 2005 and was fortunate enough to be able to tour some parts of the country then. We visited the city of Agra during my first trip (extra brownie points to Denise for correctly guessing that! 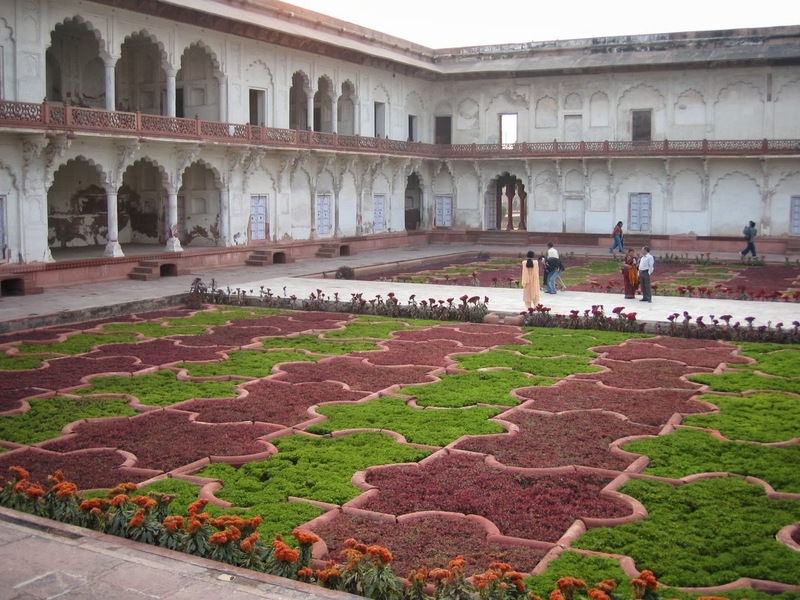 ), which is where the Taj Mahal is located, as well as Agra Fort, where the photo of this fabulous puzzle lawn came from. 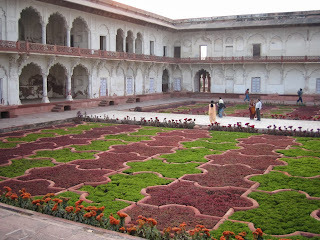 In addition to fabulous lawns, I couldn't help but be impressed by the stunning architecture of Agra Fort. The Agra Fort has a long and colorful history - records from 1080 AD mention it being captured by an invading force! 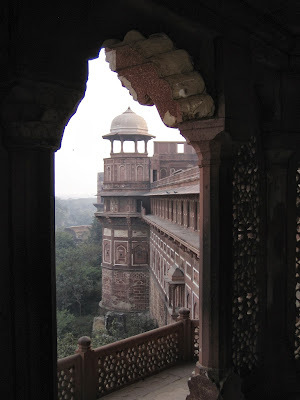 After several other turbulent government turnovers, it was eventually rebuilt in the 1500's by the famous emperor Akbar the Great. He rebuilt it using red sandstone, the reason it is also known as 'the Red Fort of Agra'. 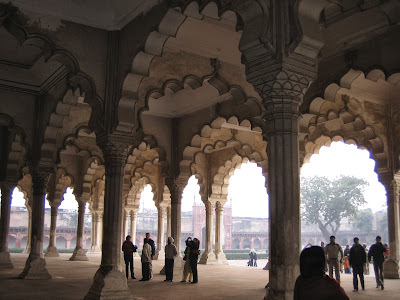 Agra Fort also plays a small part in the tragic love story surrounding the Taj Mahal. 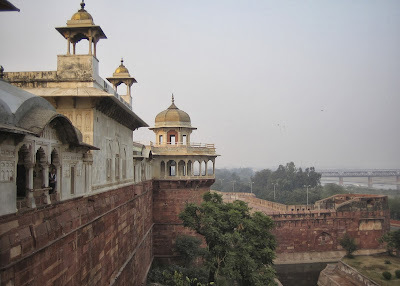 Shah Jahan, the ruler who built the Taj Mahal, ended up being imprisoned at the fort by his own overly ambitious son. He allegedly spent his last days laying in the tower there that overlooked the Taj Mahal, gazing at his monument to his beloved wife. On my first trip to India, we also visited the beautiful state of Kerala, located on the southwestern tip of India (brownie points to Usha for identifying that location!) I think you can see why it is sometimes referred to as 'God's own country'. 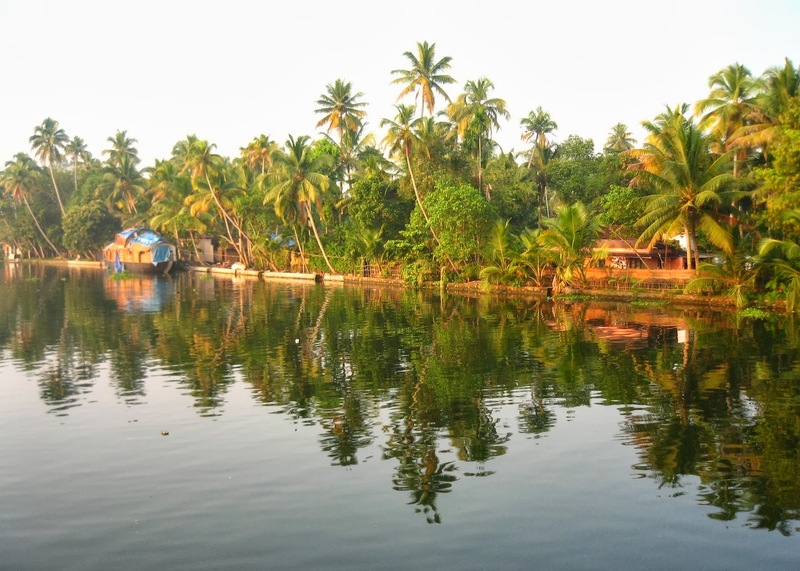 Besides being a prime destination for tourism, Kerala is also where many spices are grown and produced, such as pepper, cinnamon, nutmeg, and cardamom. Rice, coconuts, cashews, coffee, and tea are also exported from there. 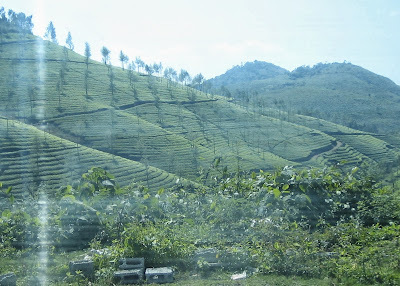 This is a tea plantation. Workers make their way throughout the rows of bushes, handpicking the leaves for tea. *Sorry, brownie points are still not redeemable for actual brownies..
Where in the World is..
Our poor new house still had just an open field of bare dirt for the front yard, nothing like this! It was a whirlwind preparation which included us scrambling to buy some extra furniture, me baking at all hours of the night, and boxes of dirty dishes being hidden in the basement (shh.. don't tell my Mother-in-law!) But in the end our house was ready(ish) and a great time was had by all. Okay, time for a vacation now! After the wedding was over a different kind of preparation started. Suitcases were packed and vaccines were brought up to date - we were traveling to another country. The honeymooning couple were meeting us in the country where Mr. Red House's grandparents live. His grandparents had been unable to travel to Boston for the wedding, as it would have been too strenuous on them, and they really wanted to see our kids, who they still had not met. So we brought the party to them! Over the river and through the woods, to the Grandparents' house we go! So where were we? Any guesses? All of the photos in this blog post were pictures I took in that country (most of them from a previous visit). Where in the world was Mrs. Red House? The winner is entitled to 100 free Brownie points*! * Brownie points may not be redeemed for actual brownies, about which Mr. Red House is very sad.